The paper is devoted to the properties of active participles’ definite forms in hagiographic narratives, and shows their usage dependancy on functions of time in text, predicate’s semantics and the type of the subject. Keywords: definite form of participles, hagiographic narrative. The paper investigates the degree of influence of verbal suffixes on the aspectual functional-semantic features of verbal nouns in Russian language, as exemplified in dictionaries and corpus-based data. Keywords: verbal noun, deverbative, aspectual semantics, imperfective suffixes. The article presents an analysis of clichés and stock phrases as indicators of media’s tolerance or intolerance in evaluation of objects, events and phenomena as “ours” or “theirs”. The author proposes substantial correlations between the concepts of political correctness and tolerance, reviews existing views to this problem in general and to its certain aspects, such as the correlation of mental clichés with verbal stamps and case phenomena; defines the markers of the categories «one’s own» — «alien», the boundaries of tolerant verbal behavior and the markers of verbal tolerance. Keywords: political correctness, tolerance, evaluation, clichés, stock phrases. The article illustrates the anthropocentrism of cognition and its reflection in scientific texts as in the case of biological texts. The author draws a parallel between anthropic cosmological principle and anthropocentrism in linguistics, viz. the presence of observer in cognition process and the language, fixing the results of this cognition. Anthropocentrism of the scientific text is connected with the anthropocentrism of the language itself and also with physical, physiological and mental features of the observer. The article analyses the language representations of (1) human time, space and quantity; (2) information received by the five senses; (3) mental operations, through the example of the comparison. Keywords: anthropic principle, anthropocentrism, observer, text. The article is devoted to the problem of status and description in modern Russian language of the phraseological units from the sphere of sport. On the one hand, these units originates from the sport slang, media language, common phraseology, and other discourses. On the other hand, such units are highly expressive and help us not only understand the world of sport more deeply, but nowadays are often used as metaphorical means in political, social and economical discourses. Keywords: phraseology, sport phraseology, discourse, idiom, sports journalism. The article analyses the use of the anthroponym Ivan in Russian folk tales, comparing it in the texts of fairy and novelistic tales. The author comes to the conclusion that in both cases the name Ivan performs the same functions, using the same means and having the same linguistic and cultural importance in all texts; there is a stylistic uniformity in the use of this anthroponym in different tales. Keywords: fairy tale, household tale, anthroponym, Ivan. The article explores existential notion of “Life” in the context of Russian national culture with its language explication in metaphorical model “life is deceptive”. The research is made as a case study of Yesenin’s poems “My Life”, “Life is a deception with charming melancholy” and “Foolish heart, don’t beat”, and solves actual linguocultural problems, such as the linguistic externalization of “national concept” in the individual poetic space, and the role of metaphor in concepts’ illustrating. The article uses sequential and fragmentary linguocultural analyses in the description of the concepts. Keywords: concept, individual author’s metaphor, sustainable metaphorical model. The paper examines the synonymous pair of univerb and generаting phrase in various options of their use. Univerb differs from the generating phrase in brevity and formal simplicity, however the main distinction between the two units is stylistic: the generating phrase is a neutral unit, while the derivative univerb is mainly used in colloquial speech, quite often lowered, expressional, emotional. For this reason the use of the univerb is connected with certain communicative conditions: on the one hand, with language economy, and on the other hand, with functional and stylistic restrictions. Keywords: univerb, generating phrase, synonyms, semantics, stylistics. The article discusses the reasons of absence in Russian Romanticism both of a general aesthetic program, and of explicit national identity. The first reason is the overgeneralized concept of Romanticism, developed in Pushkin’s era. According to this concept, the whole field of literature, created without orientation toward the ancient patterns or rules dictated by classicism, is related to Romanticism. The other reason is the situation of almost simultaneous assimilation of many contrasting features of English, French and German Romanticisms in Russia. As a result of preference of one version of European Romanticism over another, Russian authors had been creating a completely disparate art worlds. Keywords: romanticism, aesthetic program, national identity. The author is looking for a prototype image of Polish political exile pan Juliusz in Alexei Zolotarev’s novel “In the Strange Land”, and suggests that Zolotarev was influenced by the works of Polish Romantic poet Juliusz Słowacki, in particular his poems “Anhelli” and “Król-Duch”, expressing ideas of Polish messianism. These ideas are briefly discussed in the article through the prism of A. F. Hilferding’s work “Why are Russians and Poles struggling?”. The author draws a parallel between the Polish and Serbian national traditions and their understanding of messianism. Keywords: Polish exiles, Siberia, foreign land, expulsion, messianism, sacrifice, resurrection, Juliusz Słowacki, the Slavonic peoples. The article deals with the problem of national and cultural originality in interpretation of smells of the world, and the representation of the world through the smells in Russian prose works. The author specifies the poetics of smells in Russian literature, and justifies scientific and methodological approaches to the creation of olfactory picture in the artistic worlds of Russian writers. 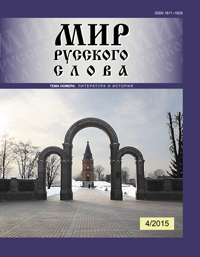 The article puts special attention to the development of olfactory poetics in the 19-20th centuries Russian prose. The author proposes general conditions and characteristics of olfactoriness, and draws perspective lines of olfactory model development in Russian literature. Keywords: olfactory, poetics of smells, Russian literature, diachrony, synchrony, language of literature. The linguistic analysis of the occurrences of the lexeme ‘square’ and its derivatives in Yevgeny Zamyatin’s literary texts identifies usual-semantic and symbolic-metaphorical streams of the content of all ‘square’ phenomena in the writer’s intertextual space. But ‘square’ is not only the textual unit, performing a syntactic function of an attribute, it is also an idiostylistic intertextual node of Zamyatin’s prose, a unit of literary discourse of his works. The article reveals the discursive parameters of the linguistic unit — in this case, of the lexeme ‘square’ — and reflects one of the ways of literary discourse analyzing. Keywords: square, symbolic, metaphor, context, discourse. The article reconstructs the complex image of the teacher of linguistics, based on the results of the directed chain associative test with multiple reactions. 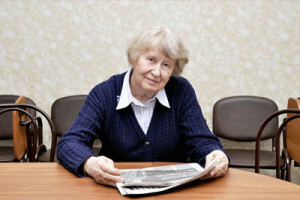 The informants were Russian university teachers and M.A. students of linguistics. Experimental data processing included the semantic classification of the reactions obtained, and their statistical analysis. The research results demonstrate that the nucleus of the profession self-image is formed by the semantic fields of “educational activity” and “subject domain”. However, the structure of professional activity image may rearrange depending on the informants’ qualification. Keywords: profession’s self-image, teacher of linguistics, associative test, semantic analysis, statistical analysis. Since the “Common European Framework of Reference” prescribes authentic speech situations as a basis for language teaching process, the teacher confronts with a number of complex methodological problems, including selection of authentic texts and their methodological processing for different levels of education. The article discusses working with complicated, but stimulating natural communication texts, changing the nature and content of reading at the initial and primary stages of education in the direction of full understanding. The author proves that involvement into authentic speech situations defines the usefulness of a text for the “appropriation” of its language, for the development of communicative competence, and for overcoming of language and content difficulties. Keywords: speech situation, Russian as a foreign language, authentic, communication teaching. The author proposes theoretical basis for teaching foreign language listening comprehension, and gives reasons for three major teaching principles: (1) no access to written text; (2) using only valid texts; (3) systematic approach. It is in the author’s opinion, that without following these principles the efficient formation of listening skills is impossible. Keywords: listening comprehension, audio text, regularity, principle. The article discusses the use of formulaic language — viz. conversational formulae on “flash cards” — as a part of preparation for “Speaking” Paper of TORFL. The author compares this method with the ones commonly applied, and discusses the reasons for preferential use of conversational formulae for preparation to this part of the test. The validity of this method is conceptualized within the frameworks of the speech activity theory. Keywords: formulaic language, speech activity, oral communication, conversational formulas. This article explores the phenomenon of Russian-Czech language interference, concentrating on the distinctive features of the interference at the beginner and advanced levels, and demonstrating the most widespread examples of lexical and phonetic interference errors at various levels of studies. Keywords: Russian-Czech interference, beginner language level, advanced language level, students’ errors.